Telzio Call Queues enable you to automate incoming call overflow by placing callers in a virtual line until the next agent is available. 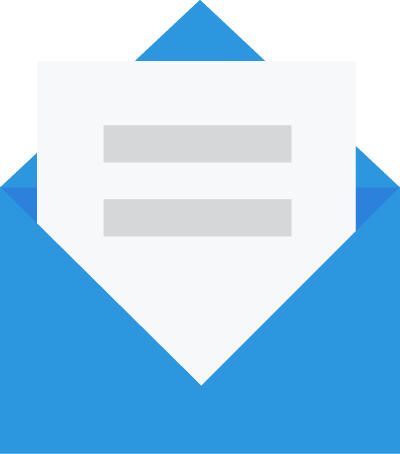 You can create different queues for each department, and assign employees to receive calls from one or more queues. In this article, you’ll learn about Call Queues and how you can use them as part of your phone system. 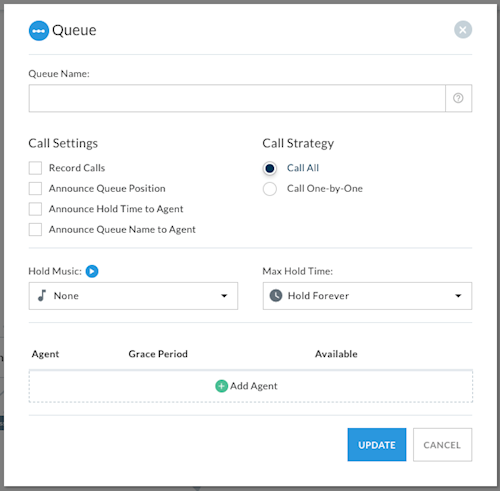 Before you get started, you’ll need to create Users for your phone system in order to add Agents to your Queue. When we talk about Call Queues, we use some terminology that you should familiarize yourself with before you get started. The employee or User of your phone system. The amount of time until the agent receives the next call. The amount of time a call will attempt to ring an agent before moving onto the next agent. The pattern for routing calls to agents. Call All – Calls all agents simultaneously, and the first to pick up gets the call. Call One-by-One – Calls agents one at a time, starting with the agent who hasn’t received a call from the queue the longest. Here are steps to help you add a Queue to your phone system. First you’ll need to pick a Call Flow to start with where you’ll add the Queue. Type in a Queue Name in the first field provided. Naming Queues will help you identify them in your Call Flow view, and help your agents identify where calls are coming from. Select the desired Call Settings. Records all calls routed through the Queue and stores Recordings in your dashboard. Offers callers in the Queue a callback when there are more than 2 callers in the Queue. When the caller reaches the front of the Queue, the call first connects to the agent, then calls back the caller. Announces the caller’s place in line when they are placed in the Queue. Announces the amount of time the caller has been waiting when the agent picks up. Announces the Queue Name to the agent when they pick up. Select the desired Call Distribution method. Calls all agents in the list simultaneously, and the first to pick up gets the call. Calls agents one at a time, starting with the agent who hasn’t received a call from the queue the longest. Select the desired Hold Music from the drop down list. Select the Max Hold Time for callers to wait in the Queue. When a caller reaches the Max Hold Time, they will be routed to the next Action in the Call Flow. Select an Agent from your users in the drop down list. Specify the Grace Period between calls. Specify the Timeout period the Agent has to answer the call. Mark the box under Available to make the Agent active in the Queue. Click the X button to remove the Agent from the Queue. When you’ve finished configuring your settings and adding agents to the Queue, click Update. 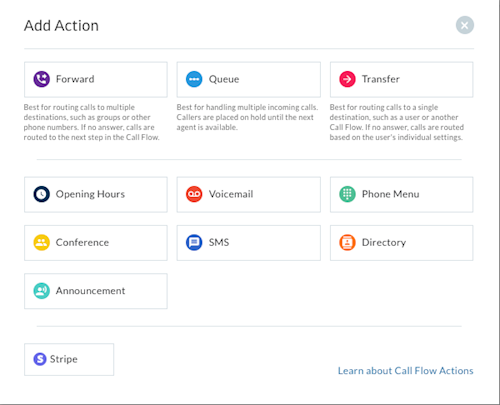 You can activate and de-activate Agents from Queues within the Call Flow Action, by marking the box under Available. Agents can de-activate and activate themselves from their assigned Queues on their dashboard, and by dialing *1 from their device. Callers can exit the Queue anytime by pressing 0, which routes them to the next action in the Call Flow.